Hello and welcome to VENNDY's Blog. VENNDY democratizes the process of using affiliate marketing, with its web-based affiliate marketing tools making it possible for everyone to monetize their content and easily share and distribute. Using VENNDY you can create your experience-based affiliate shop with no inventory, no customers, no shipping; all you have to do is to promote places, items, and products you have tried and love!!!! (*) Provided you are an affiliate of one of the networks who’s terms and conditions allow working with a tool such as VENNDY, VENNDY may be a good fit for you. Check the list of affiliate networks that may be of interest for you. Whether you’re a stay-at-home-mom, a traveler or a wellness coach, you can share all the tips you usually share with friends and family with a larger audience and earn commissions on sales made through your promoted products places, and services. Are you ready to use your blog and social media to create a passive stream of income? You can make money from your passion, knowledge or experiences and take control of your financial future. If you feel overwhelmed and frustrated from endlessly creating content for social media and seeing no compensation for all your hard work - you may want to check VENNDY! So, what does VENNDY have to offer? Simplicity – With VENNDY you can start your online affiliate shop in a few simple clicks. No need for a website, a blog, hosting, SSL certificate or to learn too many techy skills, except for how to become an affiliate. Focus – VENNDY helps you focus your monetization efforts on creating great content around your promoted items. And we really mean focus! Focus on having fun, enjoying life, and sharing it in a useful way to inspire others to take action. Tools – Using VENNDY’S tools you can monetize your content with affiliate links throughout all platforms - your blog, website, or social media - from the very beginning. (*) The tools are designed for beginners as well as more experienced content producers. We believe that influencers should be compensated for their creative content when helping others make better, easier, and more personalized choices. In a hyper connected world truth is the best marketing strategy for building trust. Trust leads to strong relationships, which increase engagements, which, in turn, improve conversion and help you monetize your content. And of the many monetization methods used by digital publishers, affiliate marketing is the one that most encourages dependable relationships. It is around this concept that we built VENNDY with tools to help you easily share your valuable experiences with your followers and help them easily access and save all your recommendations. Building these connections online takes time and effort, but once established, you can enjoy monetizing your creative content as you become a trusted maven, or expert, in your field. For example, by turning your Instagram into clickable links, you not only introduce yourself better, but you also provide greater value to your followers by improving the way they can discover new businesses and products online. Same goes for Pinterest; it is not just about pinning endless products with affiliate links but rather about telling a story by sharing a full experience. The clickable links break your story down into shoppable items. This way you provide your followers with greater value by improving the way they discover new products and businesses online. VENNDY is a three-sided marketplace bringing together cross-border online shoppers, micro-influencers, and retailers. A page is created for every item you upload. This is where you can add your review, highlight the pros and cons, rate the item, get and answer questions, and interact with your followers. For Instagram – create an Insta-Shop tab. For Pinterest – create lists or a collection of items around an experience or a subject. For Facebook – create a story, all organized in a shop-like layout. For YouTube – create an affiliate marketing shop and direct your audience to search, shop, or save all your recommendations for later. You curate your content once, add your affiliate link once, link it to a few different experiences you have collated, and share it across any platform you choose. You thus increase your social reach, grow your influence, and boost your income all at the same time. 1. Join Affiliate Networks. Become an affiliate at any of the top-tier affiliate networks. You can also join independent affiliate programs and add those as well. Make sure to join networks and programs for beginners, as they are less strict about traffic and time limits for making a sale. 2. Join VENNDY. Sign up to VENNDY and download the VENNDY LinkCollector ((**)currently by invite). When you discover something you think your audience will love, you collect it in VENNDY and add your affiliate link so that you can monetize your recommendations. Make sure you comply with the affiliate network’s terms and conditions and you update the settings in your account to include your user’s URL on VENNDY. Some of the networks require it for tracking purposes. 3. Earn Commissions. Use VENNDY’s tools to share your recommendations on your favorite digital platforms and start earning affiliate commissions on the products and services your followers buy through your links. (**) Note: We are currently in Beta stage, offering only the free subscription version to VENNDY’s tools. VENNDY is perfect for digital entrepreneurs, influencers, bloggers, and content publishers who want to: 1) BE different and 2) MAKE a difference in people’s lives. Connect with your audience. If you want to connect to your audience in a meaningful way, if you’re determined to provide quality, valuable, and helpful information and want to generate an income at the same time, then VENNDY is for you. If you’re excited about helping a tourist discover the best walking tours, a busy working mother find the perfect mix-and-match wardrobe, or a foodie enjoy the best pasta in town, then VENNDY is for you. Grow your social reach. Whether you’re just starting out or already have a large and loyal following, VENNDY offers you a way to grow your audience, your social reach, and your revenue. Be a maven in your field and change the way consumers discover new businesses and products online. You can make a difference in other people’s lives, be it a consumer you just introduced to a great business they’d never heard about or a young fashion designer you helped reach a new group of happy customers. With VENNDY you can multiply your income potential and build your audience while doing what you love. And you can do it when you want and where you want. Passive Income for Flexible Lifestyles. With VENNDY you only need to curate the product, place, or service once. You can then easily generate links or shopping widgets to share on your blog, Facebook, Instagram, Twitter, or any other websites. Your links and widgets keep on working around the clock, even when you’re not. For Beginners and Experts Alike. New bloggers and content publishers can start to make money from the start without waiting to build up a mass following. VENNDY levels the monetization playing field, allowing every voice to be heard. Multiple Monetization Options. VENNDY supports content monetization via almost any platform you choose to publish on, using links from most affiliate networks you join (as long as it complies with the network terms and restrictions). This means more choices and greater potential earnings for you. Complete Control and Report Tracking. You’re always in full control of your affiliate relationships, with affiliate sales and commission tracking coming straight from your affiliate networks. You’re also in direct contact with your favorite brands and retailers; we don’t get in the middle nor do we take a cut. Relationship Building. VENNDY helps you position yourself as an expert and as someone to trust. When you share and recommend your personal lifestyle choices (and associated products and services), your audience build a genuine relationship with you as a respected expert in your field – whether your love is for travel, fashion, wellness, food, or others. How to start using VENNDY’s tools? VENNDY’s tools offer you a simple, fast, and effective way to collect all lifestyle experiences in one place. The Link Collector collects items (products, places, blog posts, articles, and services). Rating the product and adding your notes helps you build trust by offering useful tips and reviews and, when you’re ready, you can add affiliate links to promote your stories on your blog, website, and social media sites. Turn your tips, views, and reviews into Stories which connect everything. A Story is a collection of items which describes a complete experience: where you went, what you wore, what you did, how you felt – in short, whatever you want to tell your audience about. You can add a blog post, an Instagram post, shoppable products, and non-shop-related items. No matter where you share your content, with VENNDY both your everyday and your special adventures can quickly be converted into clickable links that help your audience either buy a product you recommend or save something to their wish lists. Help others by collating useful information in your stories and sharing your tips and finds across many verticals. By using your original creative content, you can help improve the way consumers discover new products and businesses online. VENNDY’s tools allow you to work more efficiently and effectively as you grow your influence and reputation online. You’ll help your tribe find valuable and useful products and services and, at the same time, generate more commissions. What could be better than that? Are you ready to get started and sign up? Why join the beta phase? It’s a well-known fact that doing something first in any field is a great way to claim leadership and create an impact. The first bloggers to write about how to use Pinterest to drive mass traffic to their blogs, the first to write an e-book on a specific topic, the first to make thousands from selling affiliate products for blogging – they all excelled because they were innovative, creative, and the first to offer great first-hand advice. Those who followed in the early stages succeeded in riding the wave, but the further down we go, these tactics are less and less effective for new bloggers trying to join the party. Sure, being an early adopter, especially for innovative tech products, bears risks (mainly time and effort), as no one knows whether this company and product will live to the next stage. BUT this is exactly where great opportunities lie. Opportunities are found in one of those wavering decisions to become a first user who was willing to take a calculated risk and become a leader of the future ecosystem. In VENNDY’s case you even get to help dictate the direction, as we are looking for feedback to improve and grow. First, can you relate to the values on which a service is built? In the case of VENNDY, for example, do you think it is possible to find the fine balance between recommendations and compensation? What’s the best way to compensate affiliates for their time and effort? We believe affiliate marketing better serves the dilemma of who to trust as, unlike sponsored posts or free products, affiliates are paid according to performance. People have no issue with influencers getting paid by the businesses, especially if they get valuable information. 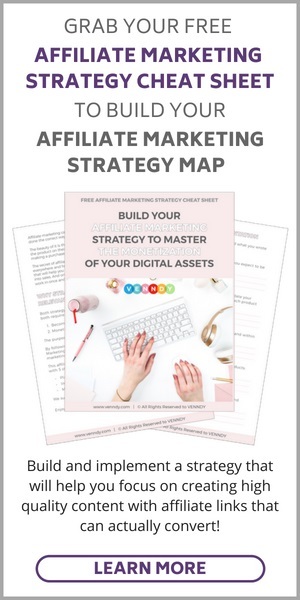 See more on this in our post How To Make Affiliate Marketing Work and Succeed as an Affiliate in Any Niche. Second, does the service offered answer your need, a need you knew you had or a need you have come to realize you have? For example, you know that once you reach a certain level of traffic, it will be easier for you to use some of the solutions already out there to monetize. But now we offer you a different approach. Don’t wait, treat your audience as potential users of your favorite products from the very beginning, and you will gradually master this channel of monetization. Third, what’s the worst thing that can happen? Will you lose everything you’ve worked so hard for? Will it lose you money? What risk, if any, are you taking? From experience with our alfa users we know that VENNDY enriched users’ experiences and was also very manageable and easy to change, mute, or remove. Obviously, there is no one size that fits all, certainly not in the early stages, but if you are willing to give it a chance and still need some convincing, feel free to write to us, ask questions, or request additional information. We’ll do our best to address your concerns and fears.